I was doing a vRealize Operations demo with a customer today and they had a specific request on how to see some CPU data. They wanted to see a list of physical hosts, CPU utilization metrics on each of those hosts, and then be able to drill into specific CPU stats for the VMs running on the host. We will create a custom dashboard to easily display this information. Here’s the finished product first. On the top left, we want all of our hosts and clusters to display. When you click on a host or cluster, we want the host metrics to show up in the top right box. 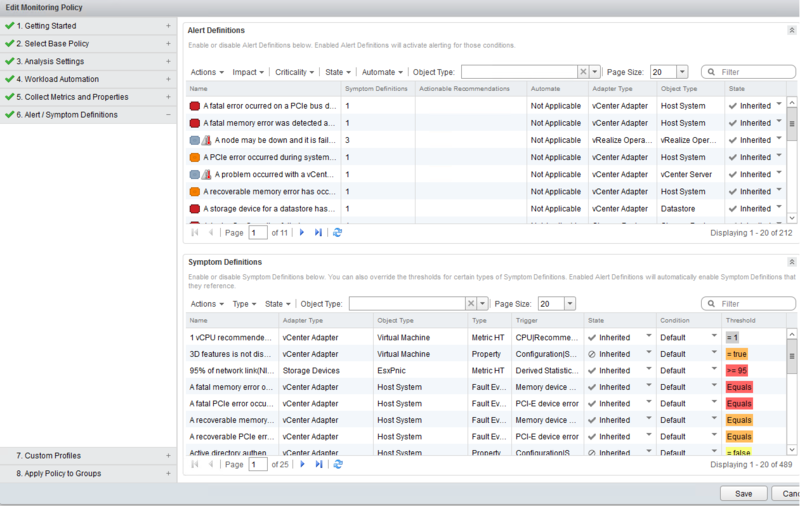 Then, we want all of the VMs in the host or cluster to show up in the bottom left box with VM-specific metrics. 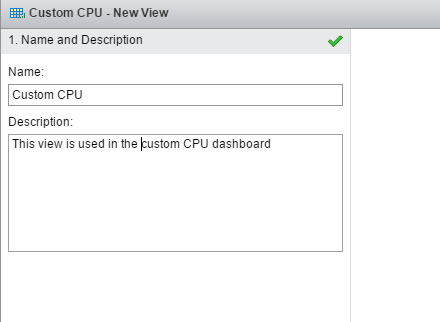 First, we want to create a new custom view for the host CPU metrics. 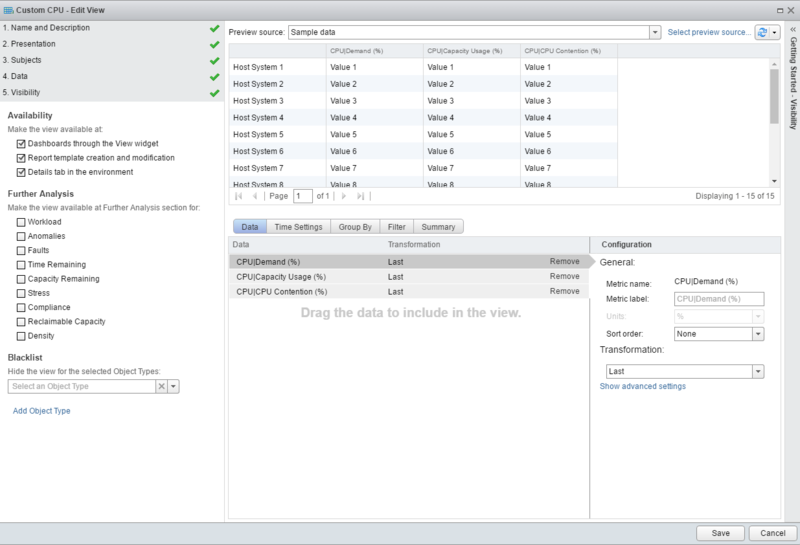 There are many out-of-the-box views inside vROps – you can use any of them, or create your own. We will see both methods in this post – a custom view for the host metrics, and an out-of-the-box view for the VM metrics. To create a new view, go into Views and click the green plus. Name the view and add a description. 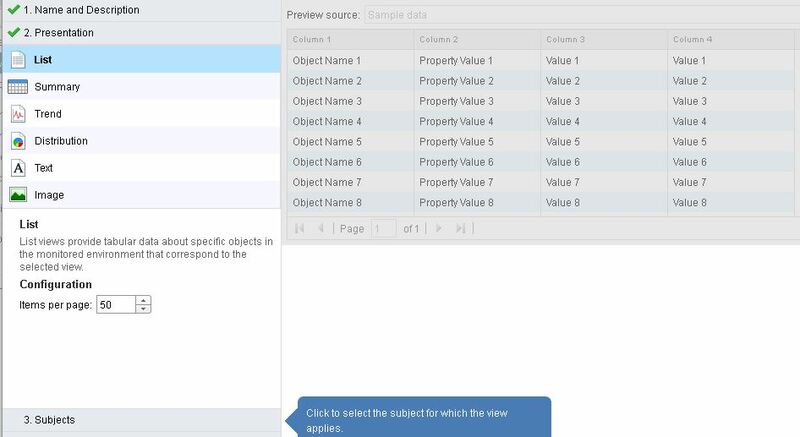 Pick how our data will display – in this case we’ll want the data displayed in a list format with columns. We want 3 host metrics to show. CPU Demand will show me how much CPU the VMs on the host are demanding. CPU Capacity Usage will show me how much CPU is actually used. CPU Demand can be higher than CPU Capacity Used due to limits, either directly on the VM or imposed by resource pools. There are resource pool limits in this test environment, so we might expect to see higher CPU demand than usage. The final metric we want is CPU Contention. We drag them from the metrics on the right to the include box in the middle. Finally, we pick the availability settings for our new view. We want to be able to include it in Dashboards, so we make sure that box is checked. A couple other boxes are checked by default – we leave them checked. Now we create a new dashboard from the Home screen, click on Actions, then Create Dashboard. Name the dashboard and provide a description. We’re going to add 3 widgets to our dashboard. First, we drag an Object List widget into the top left corner. We then drag a View widget into the top right and bottom left. Now, we customize the Object List. Click on the Edit button. We name the Object List. 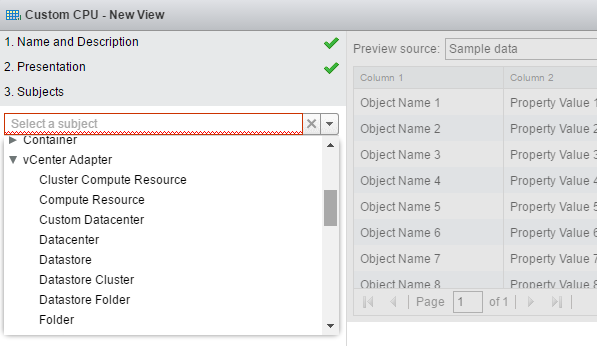 We only want vSphere Hosts and Clusters showing up, so we expand the Object Types option. We want Cluster Compute Resources and Host System. We click on the first one, then Ctrl-Click to highlight both. After these changes, we save the object list. Now, we edit the View widget on the top right. We name it Host CPU Summary, then pick our Custom CPU view that we created at the beginning of this post. We edit the bottom left view widget. 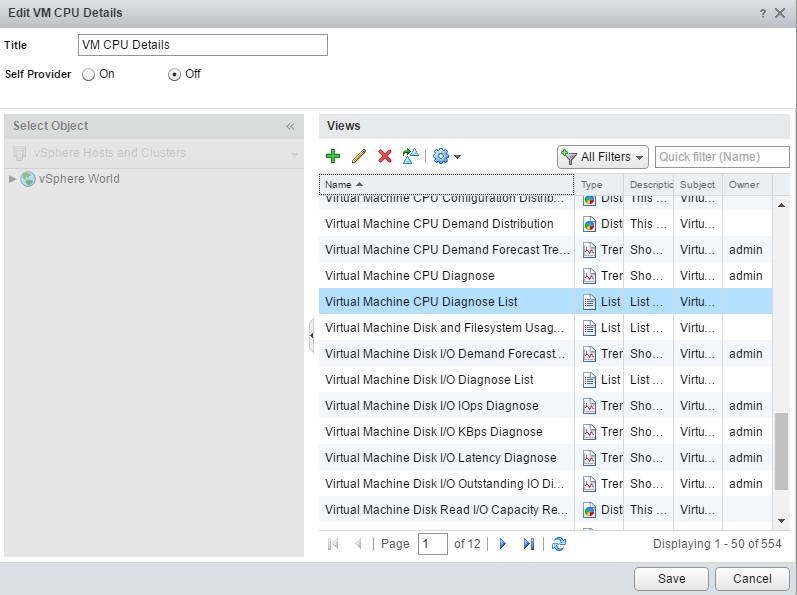 We name it VM CPU Details, and we pick a standard view called Virtual Machine CPU Diagnose List. Finally, we modify the Widget interactions. 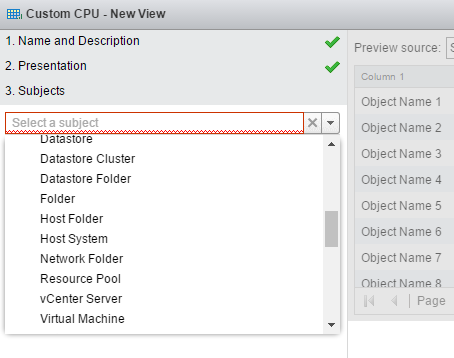 When we select a host or cluster object in the Host / Cluster list box, we want it to change the two view boxes. We configure the Widget Interactions to use the Host / Cluster List selection as the data source, and we have it feed the Host CPU Summary and VM CPU Details view boxes. Click Apply Interactions to save the interactions. 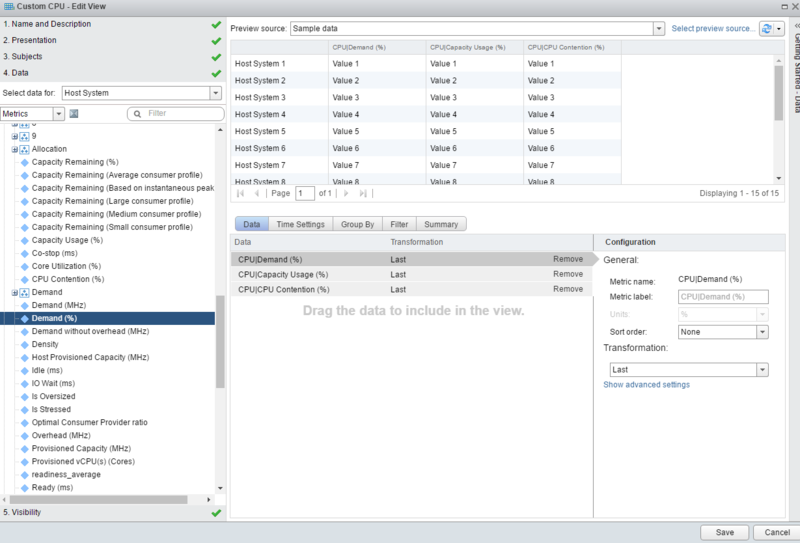 In our completed dashboard, we click on the demo-mgmt Cluster. All of the hosts in the cluster show up in the Host CPU Summary box. 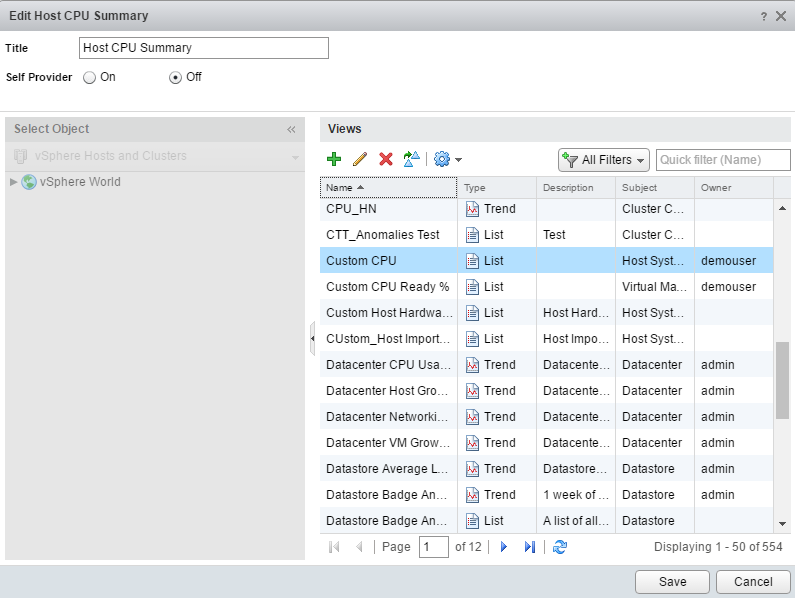 All of the VMs in the cluster show up in the VM CPU Details box. This is an example of clicking a single host – only the metrics for the one host show up in the Host CPU Summary box, and the VMs running on that one host show up in the VM CPU Details box. Here we see more of the metrics available in the Virtual Machine CPU Diagnose List view. Again, we could have created a custom view for the widget instead – it all depends on what metrics you want to show. Here is a link to the zipfile containing the JSON dashboard definition and the XML definition for the Custom CPU view that we created. 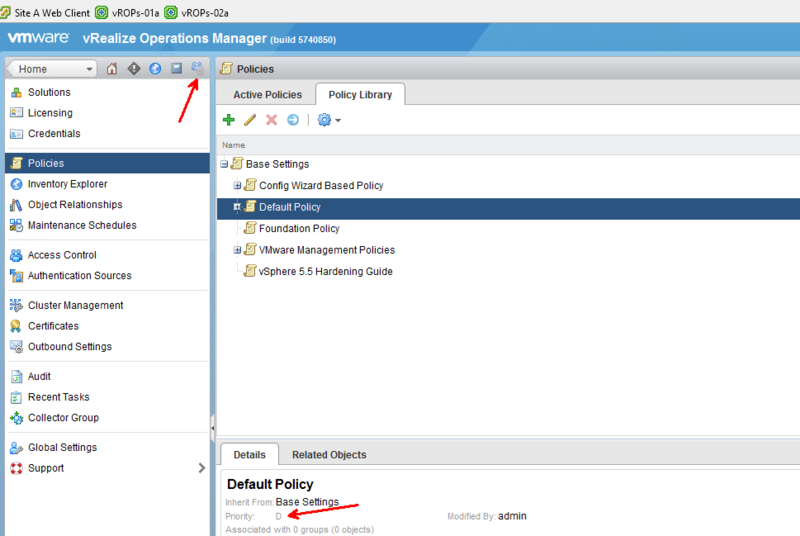 This shows you how to create a custom monitoring policy in vROps 6. 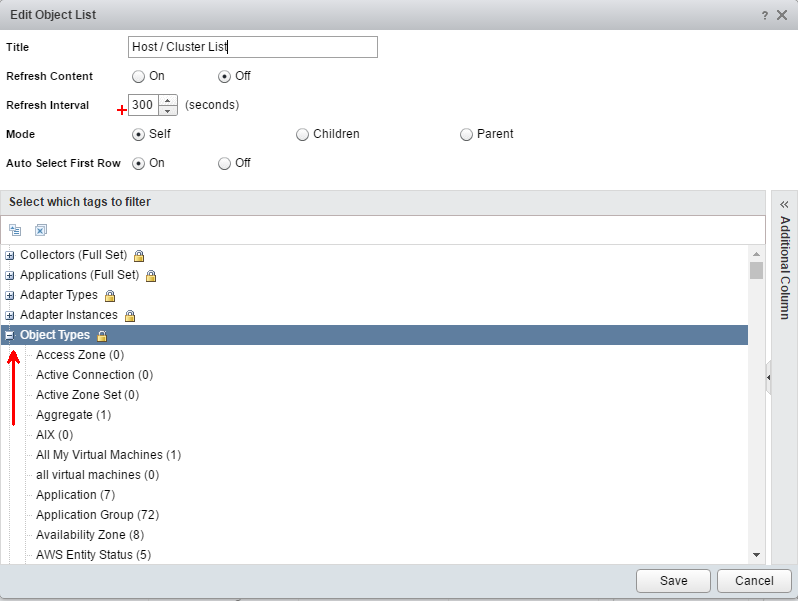 First, this is what my cluster looks like in the lab vCenter Web Client. In this scenario, we want to have a custom monitoring policy for all VMs in Cluster Site A because they are critical VMs and need a more aggressive monitoring policy. We want to change the memory % contention object to give us an alert at a lower percentage of contention. 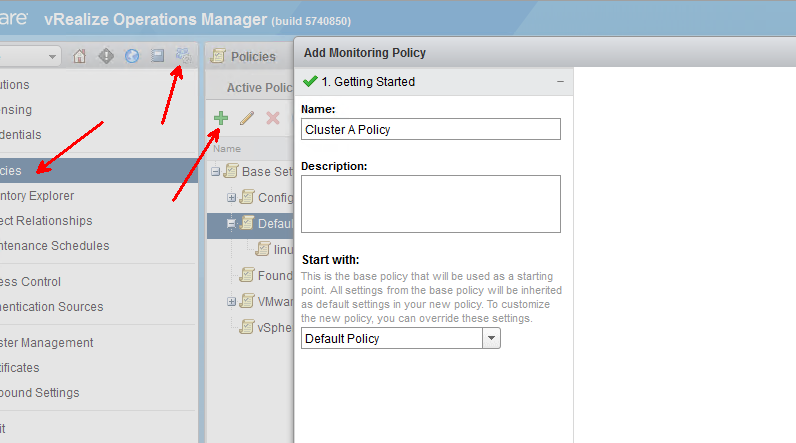 We name the group “VMs in Cluster A Prod”, pick a Group Type of “Function”, and for now pick the Default Policy. There are various group types – in this case we are separating the VMs based on function (Critical Prod). We check the Keep group membership up to date box. 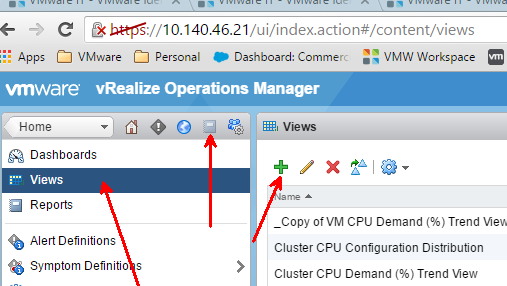 This ensures that new VMs added to the cluster get picked up by the group. 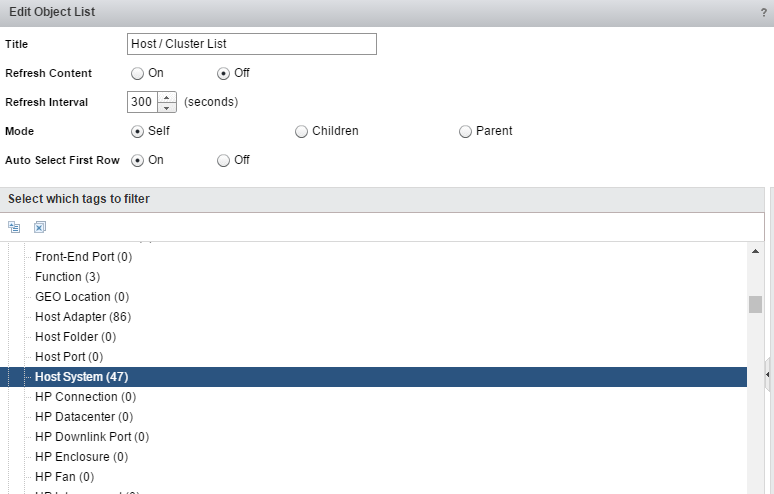 The name box autofills as we type – Cluster Site A appears, we click on it to fill the box. 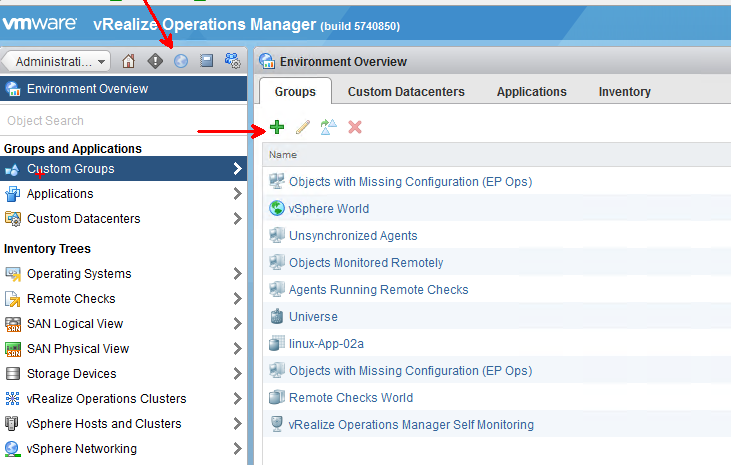 We now have our custom group of all VMs inside Cluster Site A. We now move into the Policy Library. The default policy is indicated with a priority of “D”. The concept of inheritance lets you have a master default policy, and you can then override a few specific settings based on group membership. We’re going to create a new policy for Cluster A and base it on the Default policy. We jump down to the Alert/Symptom Definitions. 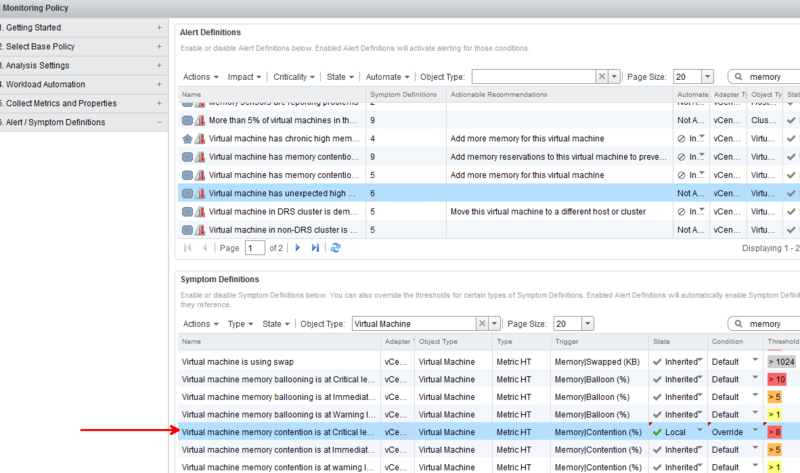 To easily find our symptom, we can pick vCenter Adapter>Virtual Machine from this dropdown, and then use “memory” on the filter box to find all VM-related memory Symptoms. Here, I’ve changed the State to Local, and Override, then changed the threshold from 10 to 8. Any VMs bound to this policy will alert when the memory contention reaches 8% instead of the default of 10%. The final step is to select our groups that will use the new policy. We check the box for our VMs in Cluster A Prod custom group. Here is the Default policy with its subordinate policies. 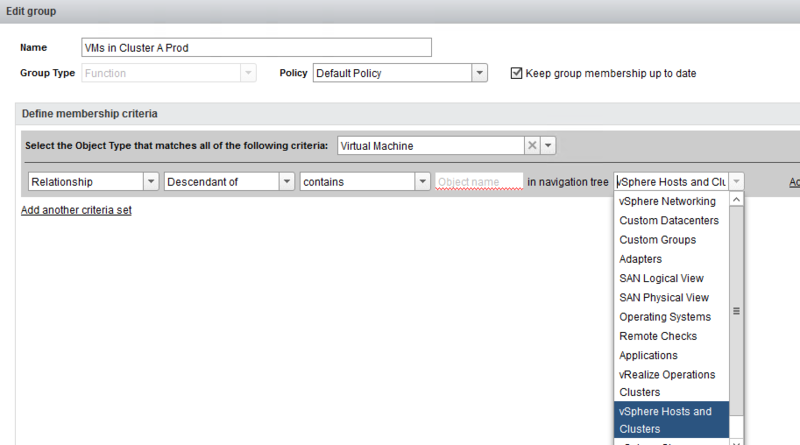 In Lab 1610, there is also another subordinate policy for a specific VM, linux-App-02a. This is an example of how granular you can get with your policies, getting down to overriding settings even for a specific VM. 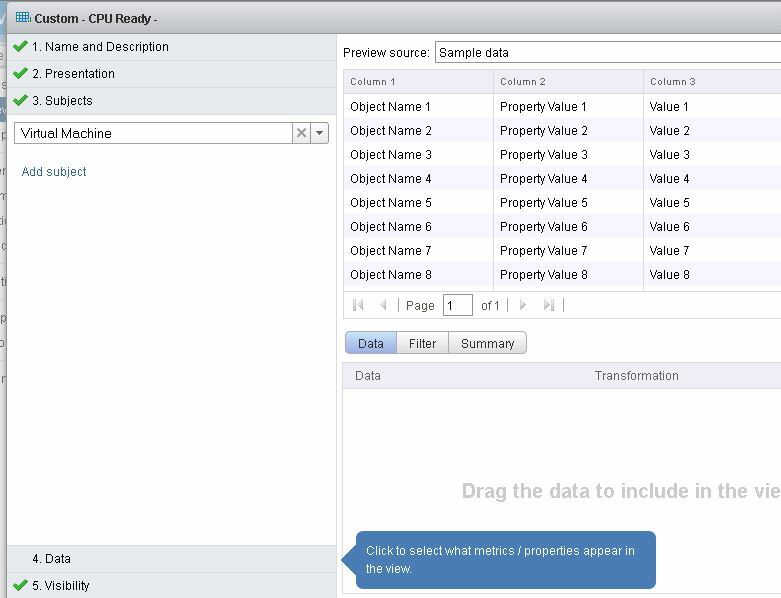 This post covers a few of the most common questions my customers ask me as I demonstrate what you can do with vROps. 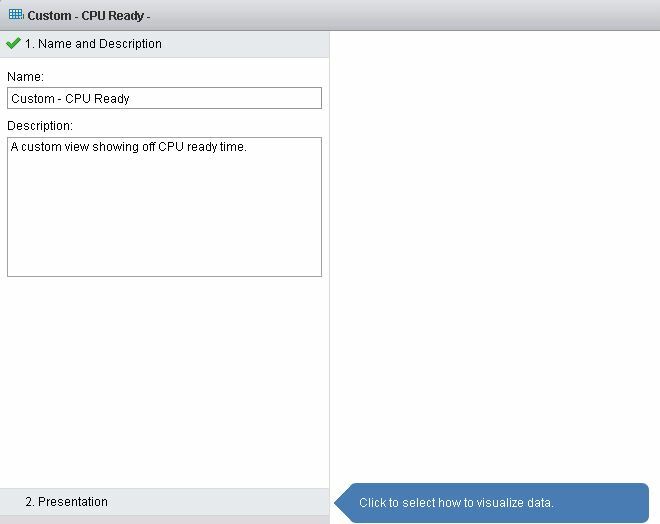 I’m going to take you through an example of needing to frequently check the CPU ready % of your VMs – this was my customer’s most recent request, but know that you can make this happen for any metric collected by vROps. First, we’re going to create a custom view for CPU Ready % by going to Content>Views, then clicking on the green Plus to add a new View. I named this one “Custom-CPU Ready” and gave it a description. Next, pick what our View looks like. 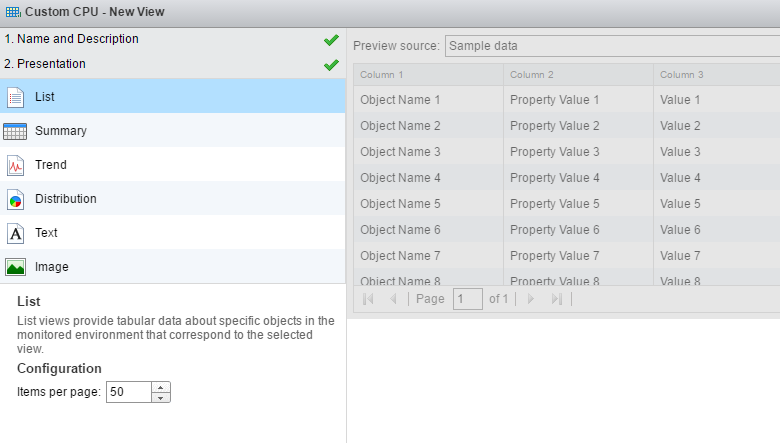 In this case, I want to see all of the data in a list format, so I pick List. Now to select the subjects – these are the objects that the View will be looking at. 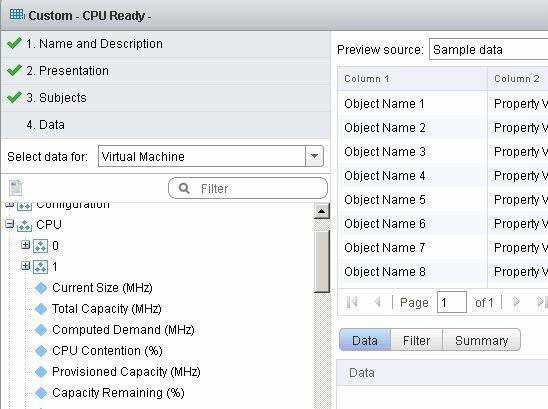 We want CPU Ready % on Virtual Machines, so we pick the vCenter Adapter and scroll down until we find Virtual Machine. Double-click on it when you find it in the list on the left, it will then appear in the Data section. Change the Sort order to descending because we want to see the VM with the highest CPU ready on top. 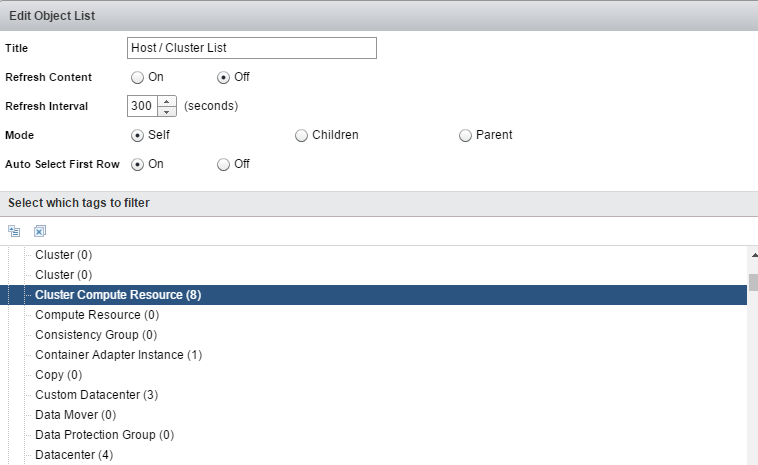 The Availability options let you control where inside vROps the View will be usable. I lef the defaults. You now see the custom view in the Views list. How can we use our brand new view? 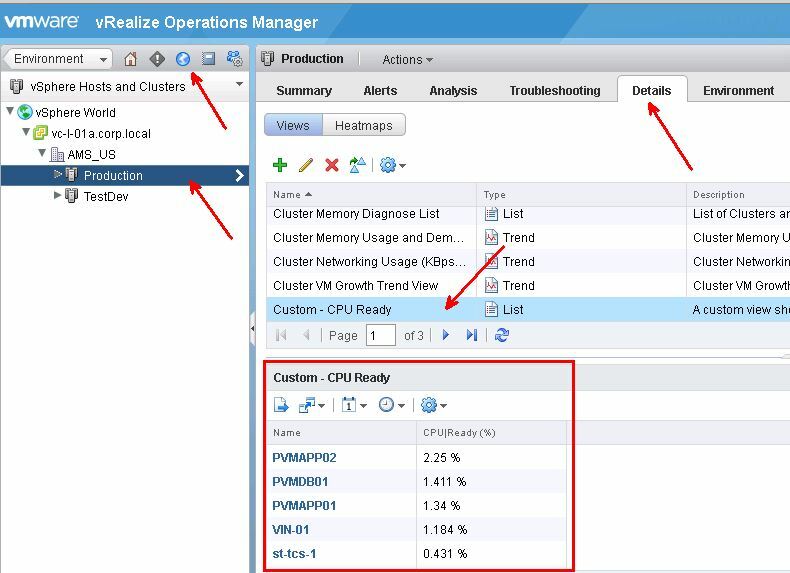 We want to see the CPU ready for all VMs in the Production cluster. 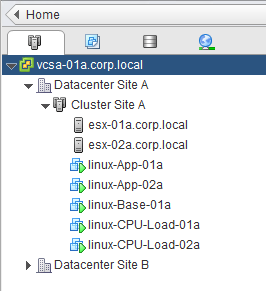 Go to Environment, then drill down into the vSphere World until you reach the Production cluster. Click on the Details tab, you can then scroll down and find the custom View that we created. Click on it and all of your VMs show up, sorted by highest CPU ready. Let’s say this is a metric that you look at at daily or multiple times a day. 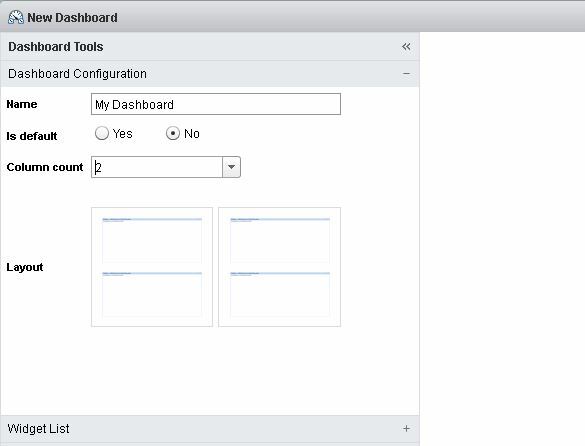 You can create a custom dashboard so the metric is immediately visible if you’re using vROps Advanced. Name the dashboard and select a layout. We want to show a View in the widget, so we drag View over into the right pane. Click the Edit icon in the blank View to customize it. 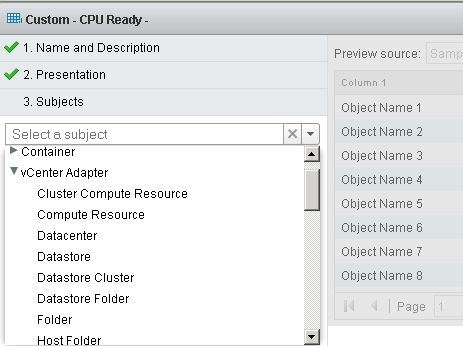 Click on Self Provider to allow us to specify the Production Cluster object on the left, then select our Custom CPU Ready View on the right and click Save. The dashboard is now ready. 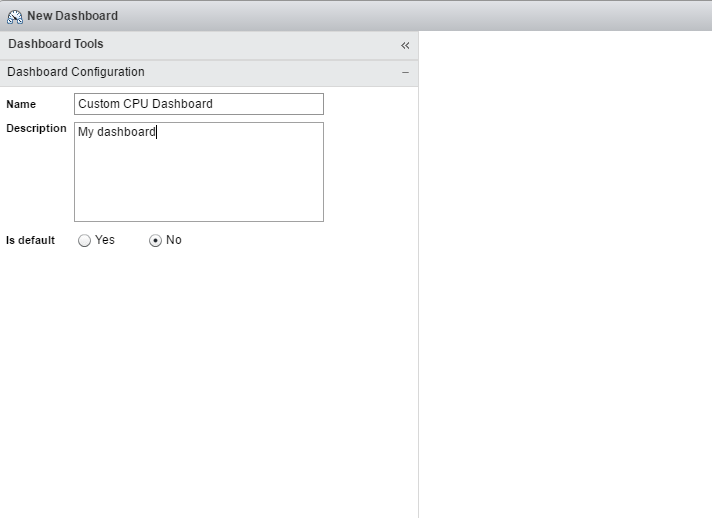 The CPU Ready for the Production VMs will now show up in the dashboard.